The practice at Vans Combi Pool for the Pro-Tec Pool Party 2012 will end today. At 3pm, the Combi will be closed to prepare the pit for the adrenaline rush of Saturday. 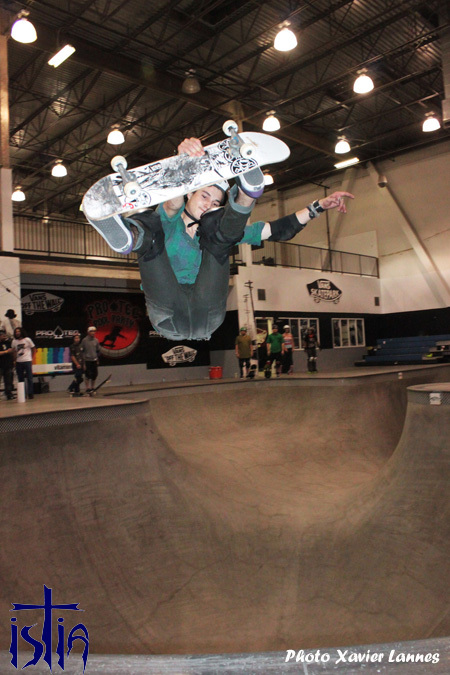 Yesterday, the qualifiers for the Pro and Masters Divisions for tomorrow’s Pro-Tec Pool Party ran to determine which riders would join the pre-selected competitors in the main event at the Vans Skatepark in Orange. Sixteen Masters Riders battled it out for four spots and 27 Pro riders fought for the final nine spots. In the Pro division Austin Poynter, winner of the amateur Combi Classic contest in January, easily qualified in the number 1 spot thanks to huge airs and lines that display a tremendous amount of progress. The Pro-Tec pool party will be his first pro contest after winning the Ams Combi Pool Classic two years in a row (2011 and 2012). Twelve year old Tom Schaar who has become a media sensation over the past month tanks to his 1080 at Woodward west and the live 1080 at the last X-games in Shangai also easily qualified with power moves usually reserved for someone much older. Tom Schaar also made it to the Guiness Books of records last week. Kalani David just arriving from Hawaii was ready 1 minute before his heat after surfing in a pro contest all morning and qualified with only one practice run before having to drop in and do battle. You can see yesterday’s Kalani David video on isTia.Tv . Austin Poynter, Tom Schaar and Kalani David are joined by 6 additional qualifying Pro division riders. There is the crazy Greyson Fletcher who lathered the crowd into a frenzy with his padless, high-speed insanity in the last Ams Combi Pool Classic in January. Kevin Kowalski and Willis Kimbel coming out of the great Pacific Northwest and slaying the bowls with unique lines and tricks. Contest destroyer Ben Hatchell brought his vert ramp skills into the combi and qualified with ease. The young Alex Sorgente made it in using some of his big wall experience from Bucky Lasek's bowl to his advantage, and longtime Pool Party pro and multiple finalist Michael Brookman made it in with ease. 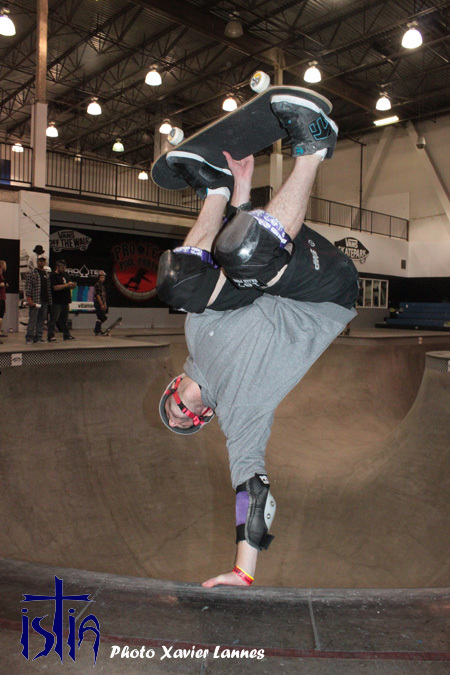 In the Masters's category, original Bones Brigade member and inventor of the 540 McTwist, Mike McGill qualified in first with excellent lines and power. There is a private screening of the new Stacy Peralta Bones movie tonight in a theatre in front on the Vans Skatepark, but you have to be on a list to be able to enter. Mike McGill will be joined by Australian powerhouse Mick Mulhall, lip trick and switchfoot master Justin Lynch, and first-year Masters division monster Darin "CookieHead" Jenkins. The legendary Eddie "El Gato" Elguera was narrowly edged out in his first time at the Combi, but with his strong lines and smooth style, he definitely will be a presence in the future. The final list is set for Saturday, be there if you can, and if not, watch the live HD webcast at 3PM PST this Saturday or via the Vans Live App. Get Hot!!! Pros: Pedro Barros (Defending Champ), Rune Glifberg (’05, ’07, ’08 winner), Bucky Lasek (’09, ’10 winner), Omar Hassan (’06 winner), Tony Trujillo, Alex Perelson, Josh Borden, Andy Macdonald, Nolan Munroe, Benji Galloway, Zach Miller, Daniel Cuervo, Brad McClain, Michael O’Friel, Josh Rodriguez, Mike Owen, Nathan Beck, Steve Piniero, Sky Siljeg, Austin Poynter, Tom Schaar, Kalani David, Greyson Fletcher, Kevin Kowalski, Willis Kimbel, Ben Hatchell, Alex Sorgente, Michael Brookman. Pro-tec Pool Party Masters: Chris Miller (Defending Champ and ’05-’09 Winner), Steve Caballero (’10 winner), Tony Hawk, Christian Hosoi, Lance Mountain, Jeff Grosso, Eric Nash, Sergie Ventura, Pat Ngoho, Steve Alba, Tony Magnusson, Brian Pennington, Lester Kasai, Mike Rogers, Aaron Astorga, Dave Reul, Pat Black, Mike Barnes, Jeff Hedges, Paul Wisniewski, Rob “Sluggo” Boyce, Mickey Guerrero, Steve Steadham, Josh, Nelson, Mike McGill, Mick Mulhall, Justin Lynch, Darin Jenkins.